AL ASAD AIR BASE, Iraq – What does an internship at the NASA Langley Research Center, the vice president of a Google Cloud Premier Partner company, and a researcher at the WorldPop Project, all have in common? The answer is Airman 1st Class Nirav Nikunj Patel, 801st Expeditionary Maintenance Squadron guidance and control avionics specialist deployed with the 1st Expeditionary Rescue Group at Al Asad Air Base, Iraq, and a geographically separated unit of the 332nd Air Expeditionary Wing in Southwest Asia. Patel unknowingly started working toward this impressive resume since he was a young boy. Patel’s grandparents, on his father’s side, started the Akhand Jyot Foundation, a non-profit in 1980 which helps provide basic services to people living in the slum areas. The foundation has helped deliver supplies from the World Health Organization, including polio vaccinations and by helping provide courses to assist women living in the area have greater social mobility. “My travels to India and my work with my grandparents’ foundation has raised me to internally refuse the outcome that people have to continually die of preventable diseases when we have the tools and treatments that just need to be applied more intelligently,” said Patel. One of the tools he learned about is geography, and how it is being used to pinpoint where things, like vaccines, would have the greatest effect. “I learned that geography as a discipline was much deeper than just memorizing states and capitals,” Patel said. In 2017, he earned his PhD in Earth Systems and Geoinformation Sciences from George Mason University, on top of his Masters in Science in Geography, and two Bachelors of Arts in Geography and Philosophy from the University of Florida. Patel, filled with a yearning to learn more and to create world changing innovations, decided that working with the Department of Defense would be his best option. Patel, with guidance from his mentors, was told that some enlisted careers would give him a better opportunity to manually apply aerospace engineering, and would better help him work toward some of his future goals. By joining the Guard, he would be able to finish his PhD and continue to work at his civilian job. Besides being able to physically work on aircraft and having the willingness to serve, Patel enjoys being an integral part of the mission at the 129th Rescue Wing in Moffett Air National Guard Base, California. “I love the mission that I’m part of in search and rescue,” said Patel. “And the equipment I get to work on are pretty impressive pieces of equipment. I also enjoy the people and the network that I’ve built of people working in many different career fields. Patel said that he also enjoys the mentorship and the experience he is getting while he helps save lives. Being fairly new to the Air Force, he is still learning about his career and is thankful for his shop who help him fix his mistakes. “I’m very lucky to have a very experienced Master Sgt. Gomez as my shop chief and other staff sergeants within my shop that seem to have endless amounts of patience for my mistakes,” Patel said. In the meantime, Patel also wants to continue doing population mapping research for WorldPop, and possibly start teaching at a local university in the San Francisco Bay Area. He also wants to work on the next iteration of the Global Positioning System, something the DoD and NASA are working on. 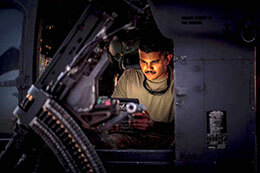 Patel is currently waiting for an opportunity to join the Defense Innovation Unit Experimental this fall, which is right across the flightline from his home unit. Bay area native Nirav is the son of Nikunj and Gaurangi Patel of Tampa. Construction for the new Sanatan Mandir in Tampa (311 E. Palm Ave.) is at its final stretch, thanks to the generous support of many devotees and donors. The temple has set a Prana Pratistha Committee, under Chairman Dr. Rakesh Sharma. This article describes the meaning, process and significance of Prana Pratistha Mahotsav, which will be on April 9-13, 2019. Idol worship is an integral and simple way for Hindus to express their faith, love and devotion to God from the time immemorial. This form of worship perhaps sowed its seeds during the Vedic age. In Ramayana, both Rama and Ravana worshipped the images and symbols of Shiva. In Mahabharata, Arjuna worshipped Shiva to obtain the mighty Pashupatastra weapon. Ekalavya worshipped the image of his guru Dronacharya. This form of worship continued to grow during the Mauryan period and gained further popularity in the post-Mauryan period when idols and temples began surfacing in various parts of India. “Prana” means “universal life force.” “Prati? ?ha,” used in connection with an idol or “murti” means "the consecration of an idol or image." Thus, “Prana Pratistha” refers to infusing life force into an idol. The process is accomplished by performing a sanctified ceremony in accordance with prescribed religious procedures. Intrinsically, it involves seeking the almighty’s permission and blessings so that the idol has a piece of his spiritual energy or “amsha” in it. Once prana pratistha is completed, the idol is transformed to an embodiment of a living God. Thus, the 330 million deities that make up the Hindu pantheon of Gods symbolize this very idea: that the divine energy lies hidden in every form of matter, awaiting only the touch of ethereal awakening. This process of rarefied awakening is known in Sanskrit as “Praana Pratishtha,” literally meaning, the establishing of life-breath. The Process. For the consecration of the deity in the temple, a specific number of priests are invited to perform the rituals. The qualified Hindu priest meticulously executes the “Prana Pratishtha” process by invoking the deific energy through sacred chants, Puranic-based rituals and scripturally enriched rites, thereby inviting the divine power to enter into the idol – a direct infusion of cosmic life-energy into mere matter. Mantra – sound, syllable or group of words that creates a spiritual transformation. Yantra – placing symbols and instruments before the deity and directing energies. Tantra – using a network of synergized energies in the form of Mantra and Yantra. Bhakti – engaging devotees’ inherent devotion to align the acquired spiritual energies into the deity. “What is Prana Pratishtha in Hinduism?” <https://www.quora.com/What-is-Prana-Pratishtha-in-Hinduism>, 10/30/2018. Parmeshwaranand, Swami. Encyclopedic Dictionary of Puranas. Sarup & Sons, 2001. Print. A, Traveller. God, Soul and Spirit. FastPencil Inc, 2013. Print. Vimal, Ram Lakhan Pandey. “Scientific Hinduism: Bringing Science and Science Closer Via Extended Dual-Aspect Monism (Dvi-Paksa Advaita).” 2011, Vision Research Institute. Damyanti Gupta and Shalini Kantayya. 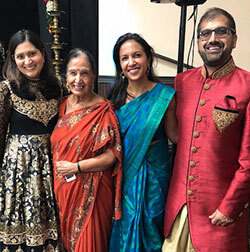 On Nov. 16 and 17, the Hindu American Foundation (HAF) held gala events in Fort Lauderdale and Tampa respectively commemorating its 15th anniversary of advocating for dignity, mutual respect and pluralism that ensures the well-being of Hindus and for all people and the planet to thrive. Both functions included an entertaining approach that exhibited the need for advocacy on issues involving education, public policy and media. In Fort Lauderdale and Tampa, HAF's keynote speaker was Shalini Kantayya, a New York-based filmmaker who spoke on protecting the environment and ecology based on Dharmic values that the divine is in all, including the sentient and non-sentient. In Tampa, Damyanti Gupta – also a keynote – passionately spoke about her difficulties in coming to the U.S., and how she successfully navigated challenging situations to become the first female engineering graduate of Oklahoma State University and the first female engineer ever employed by Ford Motor Co.
HAF also presented several awards at the Tampa gala recognizing community leaders for various achievements, including Pride of Community recipients: Dr. and Mrs. Snehal and Shetal Parikh; Madhavan Rangarajan and Damyanti Gupta; Leader of the Year: Aakash Patel; Dharma Seva recipients: Dr. K. Ventaraman and Hindu Family Support Services; and Ram and Rashmi Jakhotia; and Advancement of Dharmic Arts and Humanities, Sasenarine Persaud. 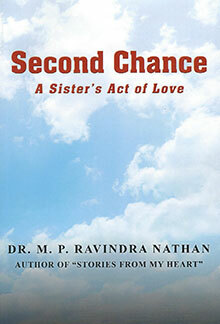 “Second Chance: A Sister's Act of Love;” published by Outskirts Press (https://outskirtspress.com; also available on amazon.com and www.bn.com); pages 250; paperback retail price $21.95. The book describes in detail the author’s long saga of his complicated kidney transplant surgery and also highlights some of the issues involved in organ donation. It also gives you a few tips to protect the health of your own kidneys. Dr. Nathan shares his unique perspective regarding the role of kidneys in your body, what happens when they fail, what are the options for treatment and what is involved in getting a kidney transplant. The main reason he wrote the book is to educate the readers – both lay public and medical personnel – that a kidney transplant is the best treatment for kidney failure and, even if you encounter complications during or after surgery, with proper management you can recover and live to enjoy your life for many years. It’s a must-read for all patients suffering from kidney disease, those who care for such patients and also for the general public.